There is something so calming about the purity of blue. Blue reminds me of floating in the warm caribbean sea while golden rays of sunlight shower down and bathe the scenery with light. It reminds me of flying above the azure waters of the hawaiian islands where the only thing obscuring the view below are teeny tiny puffs of clouds drifting like fluffy islets over a backdrop of the purest blue. Blue is a color of paradise. A color of pleasurable escape. Coming across it in nature leaves you feeling relaxed yet exhilarated. That's what I felt the other day when I was traipsing around the Brooklyn Botanical Garden in some of the fiercest heat and humidity I've experienced in a long time. Luckily for me the trees in the garden are well established and provided some respite from the heat. While checking out their rock garden I came across a quiet little area that was punctuated by brilliant bursts of blue. That blue was coming from tall stems of Platycodon grandiflorus commonly known as Balloon Flower, Chinese Bellflower, or Japanese Bellflower. The big bloom of bountiful blue that these flowers were giving turned my mood from hot and bothered to relaxed and restful. Then the details that nature designed on the petals and within caught my eye. 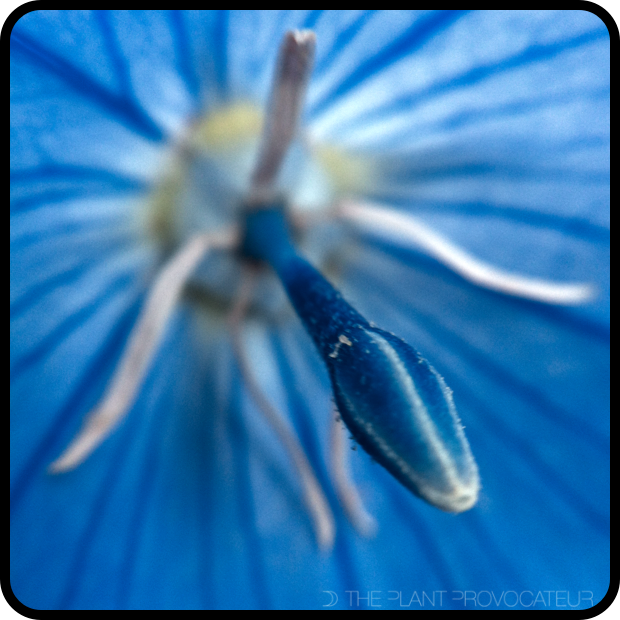 Platycodon grandiflorus takes it beauty to a whole other level with rich blue striations on its petals as well as the ethereally elegant structure of its vividly stunning style and anthers. When you get up close it almost takes your breath away. Platycodon grandiflorus comes to us from the hillside meadows of China, Japan, Korea, and Siberia. They are a clumping, deciduous perennial that grow up to 3 feet tall and 2 feet wide. In late spring, new stems emerge and outfit themselves with rich green foliage. From mid-summer through autumn, puffy pillowy buds form to burst open into flaring five star petaled 2 to 3 inch flowers of the most beautiful blue. Platycodon grandiflorus also come in other bloom color such as rose and ivory. Platycodon grandiflorus like full sun to part shade conditions, rich, well-draining soil, regular water, and is hardy down to temps well below 0 degrees fahrenheit (-40 degrees fahrenheit and celsius). Also, from first hand experience, it looks perfectly happy in heat up to 99 degrees fahrenheit/37 degrees celsius. These flowers are really beautiful not only in the garden but also as a vivid cut flower. Just cauterize cut ends to prevent any milky sap from leaking out of stems. When planted in the garden, just cut back stems in winter, leaving some to indicate where it's planted, and come late spring new growth will emerge. Super easy to care for. Super cool to grow and know.